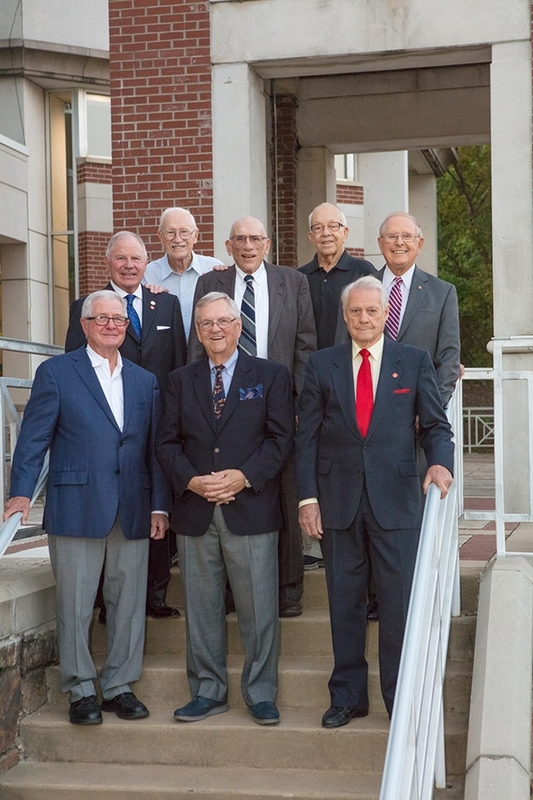 Golden Graduates recently recognized by the Arkansas Alumni Association are, front row from left, Ken Shireman, Paul Jones and Vernon Reed and, back row from left, Brooks Jackson, Joseph Wilkinson, Allen Mullins, Bob Laser and Jack See. FAYETTEVILLE, Ark. – For the third year, the Fay Jones School of Architecture and Design at the University of Arkansas honored several individuals who have made contributions to the school, university and culture of design with Awards for Distinction. These awards were presented, along with annual alumni design awards, during the school's Alumni Dinner and Recognition Ceremony, held Oct. 4 at the Janelle Y. Hembree Alumni House on the university campus. Eight school alumni were also recognized as Golden Graduates, having graduated from the university at least 50 years ago. "We're fortunate to be able to recognize those who have contributed to the school and the larger design culture of Arkansas through their service, wisdom and example," said Dean Peter MacKeith. "The diverse recipients of our Awards for Distinction this year are drawn from near and far and characterize our school's commitment to public service in the state and, indeed, in the world through the power of design." Distinguished Service Awards were given to Christine Hilker, Mark Weaver (B.Arch. '82), Coy Talley (B.L.A. '84) and Lanny McIntosh (B.Arch. '79). This distinction is awarded annually in recognition of a recipient's significant contributions to the students and resources of the Fay Jones School, the university and the community. Hilker is the director of the Smart Media Center at the Fay Jones School, and she will be retiring later this year after nearly 40 years of service. Weaver is principal and lead designer for HBG Design, the firm based in Memphis, Tennessee, and San Diego, where he's worked since 1984. He serves as co-chair of the school's Campaign Arkansas Steering Committee as well as on its Dean's Circle. Talley became a founding principal of Talley Associates in Dallas, Texas in 1993. He serves as co-chair of the school's Campaign Arkansas Steering Committee as well as on its Dean's Circle. McIntosh founded the McIntosh Group based in Tulsa, Oklahoma, in 1998. He serves as co-chair of the school's Campaign Arkansas Steering Committee as well as on its Dean's Circle. Distinguished Alumni Awards went to Mrinalini Rajagopalan (B.Arch. '96), Victor Mirontschuk (B.Arch. '74), Tommy Jameson (B.Arch. '77) and Charles McKinney (B.Arch. '81). This distinction is awarded annually in recognition of an alumnus or alumna for significant contributions to the architecture and design culture locally, regionally, nationally and internationally. Rajagopalan holds a Master of Architecture and a doctorate, both from the University of California, Berkeley. She now serves as an associate professor in the History of Art and Architecture department and is the director of graduate studies at the University of Pittsburgh. She received a 2018 Alice Davis Hitchcock Book Award from the Society of Architectural Historians for Building Histories: The Archival and Affective Lives of Five Monuments in Modern Delhi (University of Chicago Press, 2016). Mirontschuk founded EDI International in 1976, and it now has offices in New York, Texas and California. He currently serves as president, COO and chairman of the board for EDI International. Jameson is president and principal architect of Jameson Architects P.A., which was founded in 1996 in Little Rock. He was awarded the 2017 Parker Westbrook Award for Lifetime Achievement by Preserve Arkansas. McKinney spent 34 years as principal urban designer for New York City Parks and Recreation and now serves as a senior consultant to Biederman Redevelopment Ventures in New York and started the firm Practical Visionary. McKinney currently serves on the school's Campaign Arkansas Steering Committee. Distinguished Young Alumni Awards were given to Tatu Gatere (B.Arch. '10), Billy Fleming (B.L.A. '11) and Modus Studio. This is an annual distinction for an alumnus or alumna who has graduated in the last 15 years for significant contributions to the architecture and design culture locally, regionally, nationally and internationally. Gatere works as the Buildher Operations Director for Orkidstudio in Nairobi, Kenya. Fleming received a Master of Science in Community and Regional Planning from the University of Texas and a doctorate from the University of Pennsylvania, and he now serves as the Wilks Family Director for the Ian L. McHarg Center at the University of Pennsylvania School of Design in Philadelphia. He serves on the school's Campaign Arkansas Steering Committee. Modus Studio was founded in 2008 by Fay Jones School alumni and is led by partners Chris Baribeau (B.Arch. '03), Josh Siebert (B.Arch. '02) and Jason Wright (B.Arch. '04). The Fayetteville-based firm has since expanded and now has its own fabrication shop. Baribeau serves on the school's Campaign Arkansas Steering Committee, and Siebert serves on the school's Professional Advisory Board. Baribeau, Siebert and Wright were named 2018 Emerging Voices by the Architectural League of New York. Dean's Medals were given to John Ed and Isabel Anthony, Steve Lair, Lisa Lutz, Carolyn Allen, Kevin Wilcox and the Walton Family Foundation. This distinction is awarded annually in recognition of a recipient's significant contributions to the architecture and design culture of the state of Arkansas, and to students and their education at the Fay Jones School. John Ed Anthony formed Anthony Timberlands, Inc. in 1971 in Bearden, and he now serves as the chairman of the board for ATI; the Anthonys serve as members of the Towers of Old Main and the Chancellor's Society at the University of Arkansas. Lair is the president of Petromark, Inc. in Harrison. He has been a great supporter and benefactor of student scholarships in the school. Lisa Lutz and her late husband, Tom, have been great friends and benefactors of the school, and Lisa continues to support the school and its mission. Both have also been great admirers of Fay Jones and his work. Kevin Wilcox joined Stephens Inc. in 1992, and now serves as managing director for the Little Rock-based financial services firm. He is the son of Nancy and the late Jerry Wilcox, an architect and 1962 graduate of the Fay Jones School, and for whom the Jerry and J.C. Wilcox Endowed Scholarship in the school is named. The Walton Family Foundation was founded by Sam and Helen Walton and is now led by their children and grandchildren. The foundation supports three areas: K-12 education, protecting rivers and oceans and the communities they support, and investing in its home region of Northwest Arkansas and the Arkansas Mississippi Delta. The foundation has initiated the Northwest Arkansas Design Excellence Program and partnered with the Fay Jones School in community design initiatives, and most recently, the Housing Northwest Arkansas initiative. Paul Jones (B.Arch. '66), Brooks Jackson (B.Arch. '68), Joseph Wilkinson (B.Arch. '50), Vernon Reed (B.Arch. '58), Bob Laser (B.Arch. '50), Allen Mullins (B.Arch. '66), Ken Shireman (B.Arch. '63) and Jack See (B.Arch. '58) were recognized as Golden Graduates by the Arkansas Alumni Association. These are graduates from 50 or more years ago, who are automatically members of the association's Golden Tower Alumni Society.